Prince George, B.C. – After close to 30 years as a teacher and union representative in the Prince George School District, Richard Giroday will retire June 30. He spent 25 of those years in the classroom (many of those at D.P. Todd Secondary School) – teaching mathematics, science and physics – and the final four on the executive of the Prince George and District Teachers’ Association – the final two as president. “It’s been my honour to serve. I want to thank School District 57 for the wonderful career I’ve enjoyed for the past 29 years,” he told the board of education at its final public meeting of the year this week. Perhaps most satisfying however was the relationship he shared with his students. In retirement, Giroday says he plans to stay in Prince George and spend time with his 12 grandkids and one great-granddaughter. Giroday will be succeeded in his role by current first vice-president of the PGDTA Joanne Hapke. 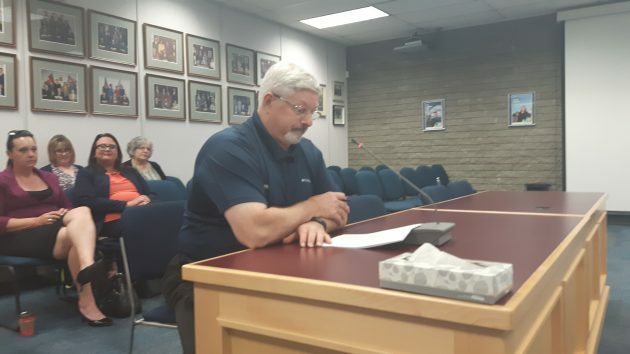 Those who worked with Giroday at the PGDTA office – Hapke, professional development Chair Glen Thielmann, and office manager Nancy Pilon, told 250News that “Richard had a unique ability to both apply principles and remain flexible when problems and issues came up in district schools. “He addressed problems through the lens of our Collective Agreement; this sometimes involved researching bargaining notes going back to the 1980s to determine how certain problems were handled in the past and how the parties came to an agreement. The trio added Richard was also present to offer a helping hand to teachers when they needed it.